At MangoApps, we see companies every day who are discouraged, annoyed and disheartened by their SharePoint experiences. Sometimes businesses become so frustrated that they aren’t even sure if collaboration tools are worth the investment. Fortunately, however, most companies understand that SharePoint is a lot like a Swiss Army Knife. While it’s array of tools may make it appealing, the limited functionality of each piece would never make it the choice of a true professional. When collaboration tools are built right and used effectively, they have the incredible potential to create employee autonomy, encourage positive company culture, and improve overall workplace productivity. MangoApps believes that every business deserves outstanding communication and collaborative success, so we’ve put together a brief report outlining just a few reasons why MangoApps is the perfect SharePoint alternative (this post is only a summary of our research and findings, for more information take a look at our complete and comprehensive SharePoint analysis). SharePoint’s price is usually a large part of what makes it so appealing, especially to startups and small businesses. The program has a low cost per user rate and is often included as part of the Microsoft Office 365 package. But unfortunately, the low or even seemingly free price tag is more than a little misleading. While the program itself is technically not more expensive, making it work effectively will almost always require incredible amounts of time or money. SharePoint is a time consuming, overly complex and difficult to understand program. Making any sense out of it is typically considered a full-time job and requires administrators to have at least some previous experience in coding or software design. Because most small businesses don’t have the necessary experience, SharePoint leaves them no choice but to spend countless hours trying to learn to programming, giving up on intranet entirely or, hiring someone to manage and run the program. Rather than being an easy to use advantage for their business, for most companies, SharePoint takes time, drains money, and perpetuates frustration and discouragement. MangoApps, as a SharePoint alternative, respects both our customer’s budgets and their intranet needs by providing quality services at an honest price. Our straightforward prices are carefully designed to keep our programs innovative and successful while remaining affordable for businesses of every size. SharePoint wastes a lot more than just administrator time. Because the program is difficult to operate and understand, administrators are usually unable to create the helpful, intuitive and information-rich pages and files employees need. The finished pages are instead diluted, disorganized and overly complex, and employees struggle to find the information. SharePoint, as a result, has difficulty retaining long-term functionality as end users eventually transition from irritation and annoyance to disengagement and apathy. Although company content might technically exist on SharePoint, finding it takes time, encourages procrastination, decreases employee engagement and reduces productivity. Even if companies do hire someone to manage and operate their SharePoint, the program’s limited functions and capabilities still make the end user experience difficult to navigate and overly complicated. MangoApps, in contrast, was built to be intuitive. We know that coding and software design is our job, and something successful business leaders shouldn’t have to worry about. As a SharePoint Alternative, MangoApps makes it easy for everyone to contribute and collaborate with our tools, no matter your tech experience level. At MangoApps, we handle the technical details, letting admins and employees focus on building your business and accomplishing goals. SharePoint is a basic intranet product that primarily focuses on internal pages and file sharing. And while these are important and useful features, SharePoint doesn’t naturally incorporate or integrate with other important collaboration tools. If an organization needs instant messaging, email alternatives, social networking, or any other collaboration tool they have to rely on additional vendors. Working with multiple vendors quickly becomes expensive as companies have to pay for and manage a large scope of contracts and programs. SharePoint is also notoriously difficult to use with non-Microsoft products. This process also inconveniences employees by requiring them to simultaneously run and keep track of multiple programs just to communicate throughout the day. MangoApps, as a SharePoint alternative, focuses on business collaboration and communication in all of its forms. We know that businesses work better when all of their tools and resources are in one centralized and easy to access location. We also know that every business is different and has its own unique needs, so we’ve broken up our various collaboration services into different sections. Our customers have access to a wide array of collaboration options but only pick and pay for what they need. We believe that businesses should have access to the exact tools they’re interested in, regardless of how many or how few they need, without paying for or being bothered by anything extra. SharePoint is only one of Microsoft’s hundreds of products, making it very difficult to get help, ask questions, or connect with a real, knowledgeable, human being. In fact, SharePoint support is so difficult to navigate that dozens of third-party businesses operate largely or entirely as SharePoint consultants or troubleshooting teams. And because of its overly complicated nature, companies using SharePoint need all of the help they can get! Without easy and accessible help, companies are again forced to try and find answers through desperate internet searches, time-consuming trial and error, or hiring a consultant or specialty company. At MangoApps, business communication and collaboration is our only focus. All we do is create, support and improve our programs, so we dedicate everything we have into making them successful. We are committed to individual customer success and are easy to work with and reach when needed. MangoApps is also open to customer feature requests. We will not only assist you with our excellent out-of-the-box features but can even design something new just for your needs. Keeping all of your collaboration tools on one platform makes management easy too. Any questions or concerns can be quickly resolved with one reliable customer care representative. Even if they’re ready to leave SharePoint, businesses are occasionally hesitant to replace a program they’ve invested so much time and energy into. Especially if they have paid for consultation services or extra storage. MangoApps understands that concern and wants to help you enjoy the best of both worlds. 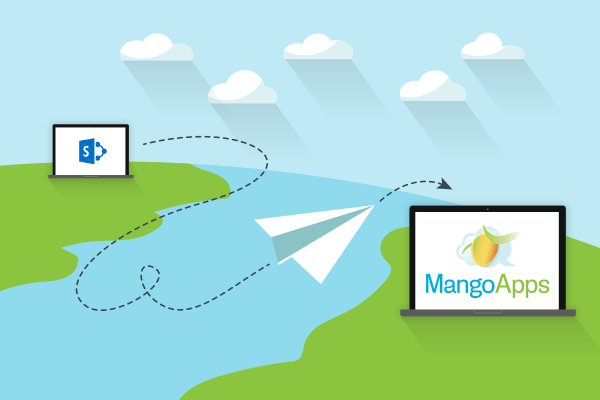 We’ve designed MangoApps to seamlessly integrate with SharePoint and automatically sync information, making the move to MangoApps completely hassles and risk-free. Our easy integration allows managers and employees to continue using SharePoint however they like while still being able to enjoy the additional collaboration tools, centralized file and content location, and continual help and support MangoApps provides. MangoApps knows the benefits that come from effective business collaboration and is here to make life easier. We work with clients all over the world and businesses in every industry and size. We understand that every organization has its own unique needs and are committed to finding the perfect communication solution. Don’t settle for SharePoint stress. 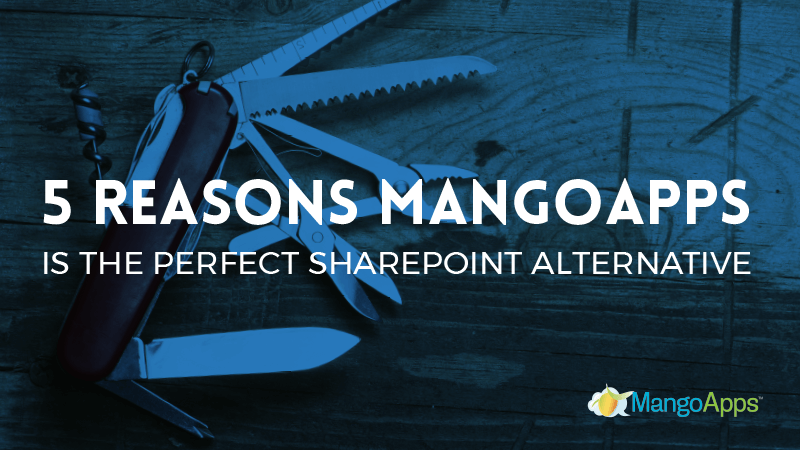 If you’re ready to reconsider or interested in learning more about MangoApps as a SharePoint alternative, schedule a personalized demo with us today.